Fenugreek (/ˈfɛnjʊɡriːk/; Trigonella foenum-graecum) is an annual plant in the family Fabaceae, with leaves consisting of three small obovate to oblong leaflets. It is cultivated worldwide as a semiarid crop. Its seeds and leaves are common ingredients in dishes from South and Central Asia. In one first-century A.D. recipe, the Romans flavoured wine with fenugreek. In the 1st century AD, in Galilee, it was grown as a staple food, as Josephus mentions it in his book, the Wars of the Jews. The English name derives via Middle French fenugrec from Latin faenugraecum, faenum Graecum meaning "Greek hay". India is a major producer, with fenugreek production in India derived from numerous states. Rajasthan accounts for over 80% of India's output. Fenugreek is used as a herb (dried or fresh leaves), spice (seeds), and vegetable (fresh leaves, sprouts, and microgreens). Sotolon is the chemical responsible for the distinctive maple syrup smell of fenugreek. Cuboid-shaped, yellow- to amber-coloured fenugreek seeds are frequently encountered in the cuisines of the Indian subcontinent, used both whole and powdered in the preparation of pickles, vegetable dishes, dal, and spice mixes such as panch phoron and sambar powder. They are often roasted to reduce bitterness and enhance flavour. Fresh fenugreek leaves are an ingredient in some curries, such as with potatoes in cuisines of the Indian subcontinent to make "aloo methi" ("potato fenugreek") curry. Sprouted seeds and fenugreek greens are used in salads. When harvested as greens, fenugreek is known as samudra methi in Maharashtra, especially in and around Mumbai, where it is often grown in sandy tracts near the sea, hence the name samudra, "ocean" in Sanskrit. Samudra methi is also grown in dry river beds in the Gangetic plains. When sold as a vegetable, the young plants are harvested with their roots still attached and sold in small bundles in the markets and bazaars. Any remaining soil is washed off to extend their shelf life. In Turkish cuisine, fenugreek seeds are used for making a paste known as çemen. Cumin, black pepper, and other spices are added into it, especially to make pastırma. In Persian cuisine, fenugreek leaves are called shanbalile. They are the key ingredient and one of several greens incorporated into ghormeh sabzi and eshkeneh as common Iranian dishes. In Egyptian cuisine, peasants in Upper Egypt add fenugreek seeds and maize to their pita bread to produce aish merahrah, a staple of their diet. Fenugreek is used in Eritrean and Ethiopian cuisine. The word for fenugreek in Amharic is abesh (or abish), and the seed is used in Ethiopia as a natural herbal medicine in the treatment of diabetes. In a 100 g amount, fenugreek seeds provide 1,350 kilojoules (323 kcal) of food energy and contain 9% water, 58% carbohydrates, 23% protein and 6% fat, with calcium at 40% of the Daily Value (DV, table). Fenugreek seeds (per 100 g) are a rich source of protein (46% DV), dietary fiber, B vitamins, and dietary minerals, particularly manganese (59% DV) and iron (262% DV) (table). Some people are allergic to fenugreek, and people who have peanut allergies or chickpea allergies may also have a reaction to fenugreek. Fenugreek seeds can cause diarrhea, dyspepsia, abdominal distention, flatulence, perspiration, and a maple-like smell to urine or breast milk. There is a risk of hypoglycemia particularly in people with diabetes; it may also interfere with the activity of anti-diabetic drugs. Because of the high content of coumarin-like compounds in fenugreek, it may interfere with the activity and dosing of anticoagulants and antiplatelet drugs. Fenugreek may affect uterine contractions and may be unsafe for women with hormone-sensitive cancers. It causes birth defects in animals and there are reports that it also causes birth defects in humans, and that it can pass through the placenta; it also appears to negatively affect male fertility, female fertility, and the viability of embryos in animals and humans. In traditional medicine, fenugreek is thought to promote digestion, induce labour, and reduce blood sugar levels in diabetics, although the evidence that fenugreek has any therapeutic worth is lacking. 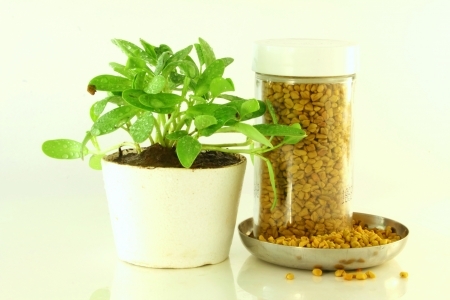 In herbalism, fenugreek is thought to increase breast milk supply in nursing mothers. This is not supported by good medical evidence and fenugreek intake is not recommended for this purpose. Fenugreek seeds and leaves contain the molecule sotolone, which imparts the aroma of fenugreek and curry in high concentrations, and maple syrup or caramel in lower concentrations. Fenugreek is used as a flavoring agent in imitation maple syrup or tea, and as a dietary supplement. A mysterious odor of maple syrup – the maple syrup event occurring in New York City in 2005 – was eventually traced to a nearby New Jersey factory of a food additives company processing fenugreek seeds. A 2016 meta-analysis combining the results of 12 small studies, of which only three were high quality, found that fenugreek may reduce some biomarkers in people with diabetes and with pre-diabetic conditions, but that better quality research would be required in order to draw conclusions. As of 2016, there was no high-quality evidence for whether fenugreek is safe and effective to relieve dysmenorrhea.